Location: Changzhou lies in the south of Jiangsu Province, Yangtze Delta area, neighboring Taihu Lake and Shanghai in the east, Nanjing in the west, and shares the boundary with Anhui Province in the south. History: Changzhou was initially recorded as Yanling in the Spring and Autumn Period (770 BC - 476 BC), and the name was continued to be used for about 350 years. It was changed successively into Piling later on. 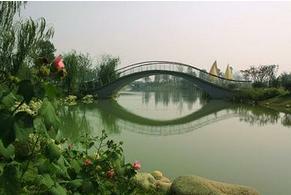 It gained the name of Changzhou in the Sui Dynasty (581 - 618). Physical Features: Due to the location in the Yangtze Delta area, fluvial plain constitute the main landform of the city. But the terrain seems more complex. To its west and south are the Maoshan Mountain and Tianmu Mountain. Generally, the land slops slightly downward from the northwest to the southeast with the Grand Canal passing through the city. Climatic Features: The city enjoys a humid monsoon climate at the transition area between subtropical and temperate zones. The four seasons varies greatly during a year. Spring and autumn are moderate, while summer and winter go extremely opposite. Summer is torrid, but gathers majority of the rainfall. The plum rain period lasts from June to July. Also during the summer, rainstorm and typhoon are more likely to happen. When to Go: The best time to visit Changzhou is in mid-spring and early autumn, for moderate temperature and less rainfall. Town of Yancheng: This historical site was the only ruins of Chinese old town with three city walls and three moats kept from the Spring and Autumn Period. Three thousands years of history not only left people the enigma about the town's ruler but also gave the town big reputation. Tianning Temple: Built in the Tang Dynasty (618-907), the temple has more than 1,300 years' of history being one of the most famous Buddhist sites in Southeast China. The Emperor Qianlong of the Qing Dynasty (1644-1911) visited Tianning Temple for three times. Apart from halls and towers, the brick carvings of the Five Hundred Disciples of Buddha and twelve jade Buddhas add much luster to the temple. Tianmu Lake: The lake is located at the north foot of the Tianmu Mountain, one hour's drive (in Liyang City) from the downtown Changzhou. It is formed by the construction of reservoirs in this region. The lake perfectly complements the surrounding natural sceneries. Combs Alley: Comb making brought Changzhou great fame since a long time ago. Every family in the Combs Alley made a living as combs maker in Qing Dynasty. Built on the side of the Grand Canal, courier station was established in the alley in the Ming Dynasty (1368-1644).